If you’ve played Let’s Golf for the iPhone and iPod touch, then you already know nearly exactly what to expect from Let’s Golf HD for the iPad. When Gameloft readied Let’s Golf for the iPad, the company simply took everything that worked in the original and—to borrow a word from Dr. Seuss—biggered it. For the most part, this super-sizing works out wonderfully, since the original Let’s Golf is a delightfully fun and well-polished game. Unfortunately, some annoyances from the original made the jump to the iPad version, too—notably, the painfully unnecessary 30-second video that starts every time you launch the app. You can skip the video by tapping the Done button, but I’ll keep complaining until developers appreciate the fact that when we’re gaming on portable devices, we don’t want to be forced to dismiss videos every single time we play. My own personal pet peeve aside, Let’s Golf HD shines on the iPad. The visuals are simply lovely; the game’s cartoony aesthetic works well, and almost masks the fact that it’s layered on top of an impressively-nuanced golfing game. There are four golf courses available, with two available for tournament play at the start. (The other two must be unlocked.) Each is lushly detailed with its own unique look. Similarly, the game initially offers a couple stock players (with different talents), and over time you can unlock various customizations to their skill and appearance. You can also unlock different difficulty levels. In fact, Let’s Golf HD is constantly rewarding you with new trophies for all sorts of achievements; you’ll earn something almost every time you play. The game is loaded with gameplay options. You can play three random holes, play subsets of specific courses, try a specific hole, or compete in tournaments against other computer-controlled players—or your friends, via Wi-Fi or pass-and-play. Let’s Golf HD also offers online play via Gameloft LIVE! Controls are identical to the iPhone version of the game: You choose your club and angle before your shot, and then time your taps on the sliding meter for both power and accuracy. They work well, and can even be controlled with one hand if you rest the iPad on a surface while you use your other hand to, say, eat a sandwich. Also, like the original, you can choose to use “Advanced” controls, which provide a single arrow that you must trace accurately to control your shots. With either control scheme, you can optionally add spin to the ball as well. Let’s Golf HD’s audio is fine, though its soundtrack gets stale quickly. I leave the effects on and the music off now. Far more impressive are the visuals: The 3-D holes are gloriously rendered, and the attention to graphic detail is superb. You’ll spot birds, planes, and even parachutists in the sky on occasion, and each new setting looks more idyllic than the last. If you already have Let’s Golf for iPhone, the doubled version on the iPad actually looks and plays pretty decently—without the need to shell out another $5 for the HD version. 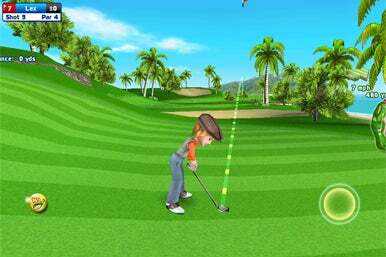 But if you don’t yet own Let’s Golf, or you truly wish to embrace the full-sized, unquestionably improved graphics that the HD version offers, it’s a very entertaining game for the iPad with enough options and unlockables to offer oodles of replayability.